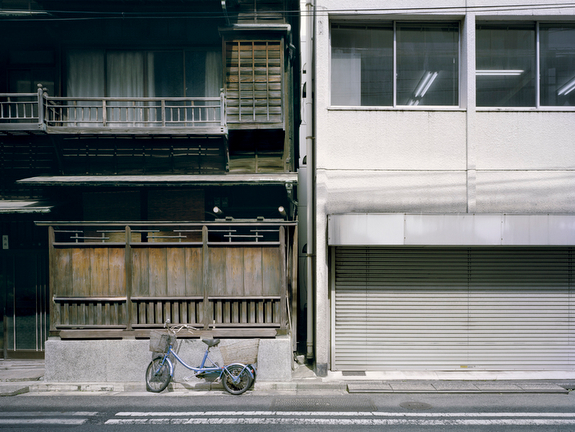 Tokyo-Ga 東京雅 (elegance/order in Tokyo) is a series about the interstices that divide and connect each building in the Japanese capital. I was inspire by the Japanese expressions for space and nothingness: Ma. Ma is the “in-between” space, an idea of the interstice between nothing and everything, between nothingness and that which is. It represents the distance necessary for two bodies to operate in space. It symbolizes the two matching qualities of union and harmony. Following this concept I created a series of urban portraits based on dyads juxtaposing opposite and complementary principles in neighbor pairs. 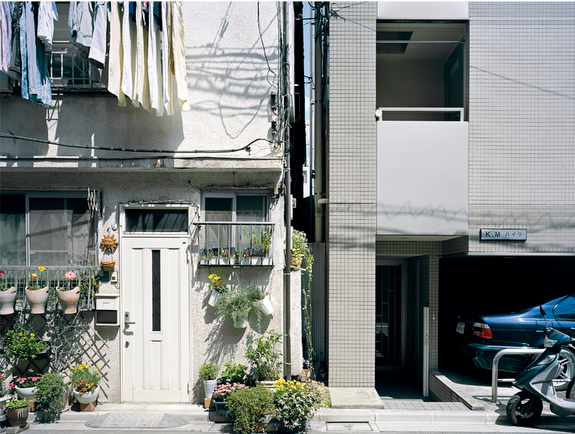 In Tokyo, the roads are made up of houses that are very close together but do not touch. They are separated by a gap that acts as air space and anti-earthquake expansion joint. These strangely-designed party walls give rise to a host of obscure interstices used for such purposes as ventilation, air conditioning or for housing cables. And yet the gap between each building links the often very different personalities and backgrounds of the invisible occupants who live there at such surprisingly close quarters. This distancing informs, without revealing them, two spheres of Japanese society: honne, which represents a person’s privacy, their real feelings, and tatemae, which literally means “façade,” the mask of public behavior and social obligations. I investigated people’s spontaneous occupation of the doorstep, which lies between public space and the façade. By using a view camera I have attempted to get beyond the ‘façade’ and catch something of that intimacy – to see the honne that lies behind the tatemae.